Wed, Feb 13, 2019, 10:39 am SL Time, ColomboPage News Desk, Sri Lanka. Feb 13, Colombo: Sri Lanka's tourist arrivals rose 2.2 percent in January 2019 compared to the same period last year, the data released today by the Sri Lanka Tourism Development Authority (SLTDA) showed. According to SLTDA report for the month, India, China, United Kingdom, Germany and Russia were Sri Lanka's top five international tourist generating markets in the month of January this year. India was the largest source of tourist traffic to Sri Lanka with 16% of the total traffic received in January 2019. 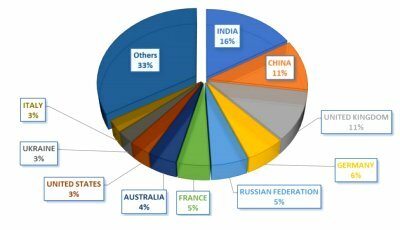 China accounted for 11% of the total traffic; while UK, Germany and Russia accounted for 11%, 6% and 5% respectively.